Description: With broad wings and a long tail, the valiant Hawk swoops and snatches its prey in this striking lighting design. Warm ambient light projects through stunning Silver Mica, which is enhanced by decorative accents and hardware in an Antique Copper finish. 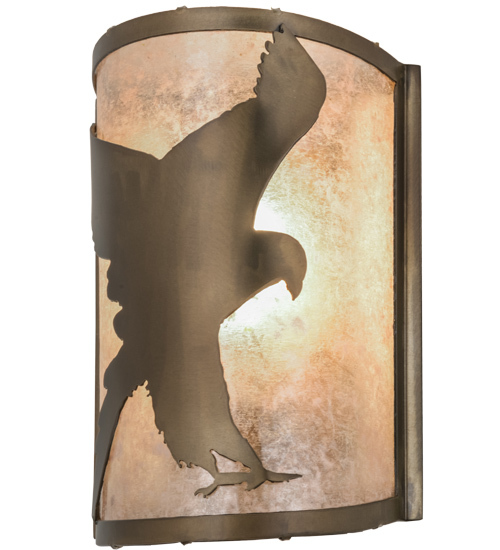 The wall fixture is ideal for illuminating hallways, entryways, foyers and other rooms and is handcrafted by Meyda artisans in the USA at the foothills of the Adirondack Mountains. Custom sizes, styles and colors are available. Energy efficient options are offered.